Pyoderma is defined as a bacterial skin infection. It comes from the Greek words pyo meaning "pus" and derma meaning "skin". Pyoderma may also be referred to as impetigo, especially in young puppies. What are the clinical signs of pyoderma? The most common clinical signs associated with pyoderma are papules or pustules that form on the skin. 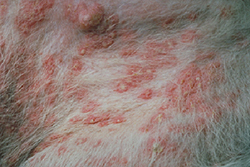 These lesions often look similar to "pimples" in humans. They are most often red and raised, with a white pus-filled center. Other signs include circular crusts, dry, flaky patches of skin, hair loss, and itching. In short-haired breeds, the coat may appear to protrude or "stick up" in areas, mimicking hives, or it may appear moth-eaten because of patchy hair loss. How did my dog get pyoderma? Bacterial skin infection occurs when the skin's surface has been broken, the skin has become injured due to chronic exposure to moisture, the normal skin bacteria have been altered or changed, the blood flow to the skin has become impaired or the immune system has been suppressed. Pyoderma is often secondary to allergic dermatitis and develops in the abrasions on the skin's surface that occur as a result of scratching. Puppies often develop "puppy pyoderma" in thinly haired areas such as the groin and underarms. Fleas, ticks, yeast or fungal skin infections, thyroid disease or hormonal imbalances, heredity and many medications may increase the risk of your pet developing pyoderma. A diagnosis of pyoderma is often based on your pet's clinical signs and medical history. Additional tests such as blood tests to determine if your pet has an endocrine disease such as hypothyroidism or hyperadrenocorticism (Cushing's disease), skin culture and antibiotic sensitivity tests and fungal cultures may be performed. In cases associated with allergic dermatitis, tests may be performed to determine your dog's specific allergies. "The typical treatment for pyoderma is antibiotic therapy for a minimum of two to six weeks." The typical treatment for pyoderma is antibiotic therapy for a minimum of two to six weeks. 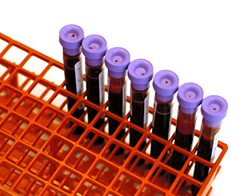 In chronic or recurrent cases, it is important to perform a skin culture and antibiotic sensitivity test to ensure that the proper antibiotic is used. Topical treatment includes sprays and medicated shampoos containing benzoyl peroxide or chlorhexidine. Additionally, it is important that your pet have clean, dry, padded bedding. What is the prognosis for my pet's condition? "Most cases of pyoderma resolve with oral antibiotics and/or topical therapy." Most cases of pyoderma resolve with oral antibiotics and/or topical therapy. Chronic or recurrent cases may require additional testing to determine if there is an underlying condition contributing to the bacterial skin infection. Routine bathing with medicated shampoos can minimize recurrences. Overall, the prognosis for uncomplicated pyoderma in the majority of cases is good to excellent.